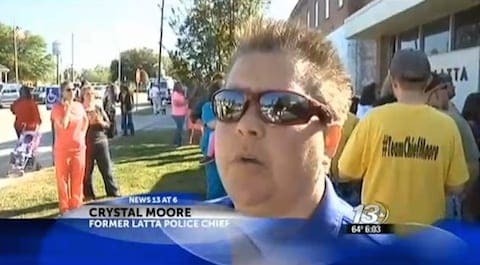 Residents of Latta, South Carolina, yesterday voted to reinstate police chief Crystal Moore, who was fired by Latta mayor Earl Bullard in April for reasons that many residents claim had to do with her sexuality. Today however, Bullard installed a new police chief in defiance of the voters' decision. Bullard caused controversy last month when after seven reprimands he fired Moore, alleging that she failed to maintain order. The mayor also questioned Moore’s authority. Moore maintained that she had not failed in her duties and that the reprimands were the first she had received in her 23 year career. Bullard's decision to remove Moore from her position came as a council member released a recorded phone call in which the mayor said that he would prefer to leave his children with an alcoholic over someone whose "lifestyle is questionable." A town grievance committee reviewed the evidence last week but found no conclusion could be reached regarding Bullard’s decision. However, hundreds of the town’s 1,400 residents vocally supported Moore and a website was set up to help her with living expenses and potential legal costs. On Monday, Moore wrote on Facebook: “Remember to VOTE, June 24th in Latta, across from Town Hall 7am-7pm. Please vote “Yes”. I am so ready to go back to work to serve and protect our town. This "Yes" vote means I will be back." Despite today's actions by Bullard, the vote will be certified this Friday, changing the town’s government structure from “mayor-strong” to “council-strong”, at which point the council will assume all hiring and firing capacity. The Council has already indicated that it intends to rehire Moore.